Round out your Project Graduation theme or a private Graduation Party with the surprise of an ice skating party in June! We’ll put our event planning experience and enthusiasm to work and transform your grad celebration into a winter wonderland with our synthetic ice rink, a snow machine, and plenty of carnival games and prizes. Our synthetic ice rinks can fit on any flat surface capable of supporting the weight of the panels and skaters, the high school gymnasium or the outdoor basketball court are both perfect settings for ice rink construction. 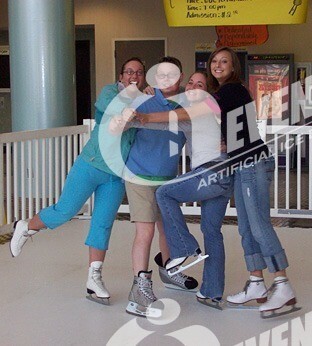 Synthetic ice is always smooth for those amazing spins and jumps that put the fun into any celebrating event.